We have three weeks and three days left of school this year. I, for one, am totally shocked. The time just flew by! My summer time planning is underway but I still feel like I need great ideas to get through the months with little drama. One of my favorite ways to spend a little busy time with my kids is to bake. We love to create something unique with a summer theme! 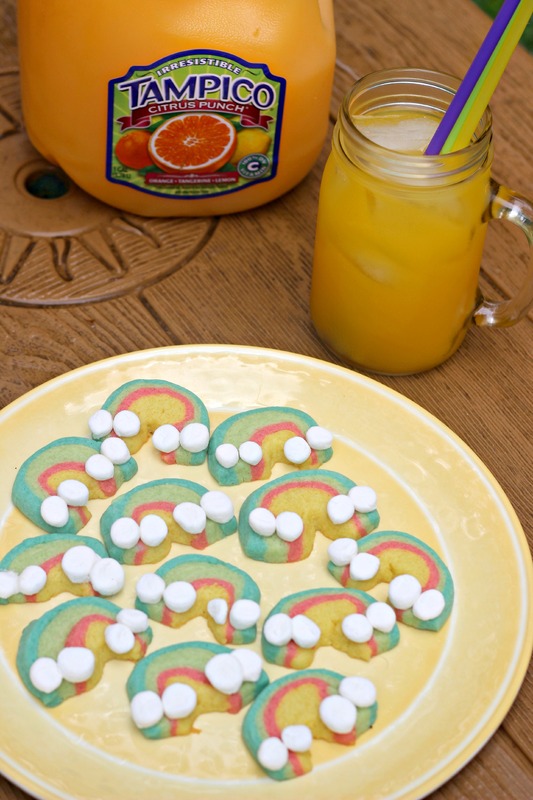 Rainbow cookies are fun for the kids, delicious to eat and serve up perfectly with Tampico Juices, which we always have on hand! The basic premise of the perfect summer time snack is easy! Always make something the kids will eat! While fruit skewers are fantastic, sometimes a little sweet at snack time can make the day extra special! I decided to try this recipe, for the first time ever, after successfully making watermelon cookies. The layer idea came from that. I chose my favorite sugar cookie cut out recipe. You need the denser dough so that rolling out and layering the colors is easier! I separated my dough into 4 piles. Using gel food coloring, which seems to hold together better with cookies, by the way, I creates a ball of red, blue, green and yellow. You can create more colors if you want, just make sure you are ready to roll them out and wrap them around the log! After a few hours in the fridge in plastic wrap, I was ready for the next step! I made a log out of the yellow, rolled out the other colors and then layered them in the color pattern I wanted. Once that was done, I put the entire log back in the fridge for another few hours. The harder the dough, the easier it is for it to keep its shape! When you are ready to cut and bake, simply pull out the log, slice it into ½” wheels and then cut those in half. Using a melon baller, cut out the middle of the rainbows! Bake the cookie at 350 degrees for about 8 minutes. While they are still warm, cut mini marshmallows in half and add them, sticky side down, to the ends for the clouds! Let them cool and serve with an ice cold glass of Tampico Juice! This perfect summer time snack is a hit with kids, and mom too, to be honest. I will be making batch after batch along with other fun snacks all summer long. How do you celebrate summer with your kids? I would love to see your food tricks!